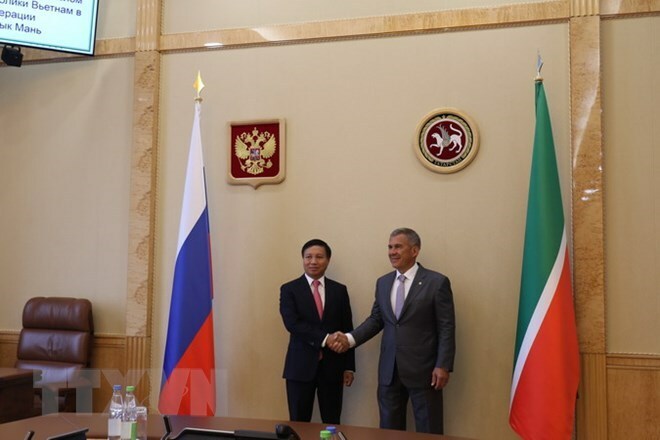 Vietnamese Ambassador to Russia Ngo Duc Manh paid a working visit to the Republic of Tatarstan, one of the republics in the Russia Federation, from July 16-19 to boost cooperation in several potential fields. At a reception for the ambassador, President of Tatarstan Rustam Minnikhanov said there is substantial room for bilateral collaboration in industrial production, especially manufacturing aircraft and automobiles, oil processing, agriculture, sports, tourism, science and technology, and education. He pledged to create optimal conditions for Vietnamese businesses to invest in special economic zones, industrial parks, and agriculture in Tatarstan. He hoped Vietnam would send more students to study in Tatarstan and set up cooperative relations between Vietnamese and Tatarstanian universities. The Vietnamese ambassador asked Tatarstan to facilitate the entry of made-in-Vietnam products – such as mobile phones, footwear, garments, and farm produce – into its trade system. He also proposed enabling young Vietnamese athletes to attend training courses at Tatarstan’s sport facilities. The diplomat hoped Tatarstan would choose to actively participate in activities to promote the Vietnam Year 2019 in Russia, and vice versa. He thanked President Minnikhanov and Tatarstan authorities for supporting overseas Vietnamese to live stable lives. He suggested Tatarstan consider making nationality recognition easier for Vietnamese who have long-term residence papers and offer free tuition at Tatarstanian universities to overseas Vietnamese children with good academic achievements. The ambassador introduced some of the potential and strengths in Vietnam’s southern province of Kien Giang, and proposed Tatarstan establish cooperative relations with the locality. During the working visit, the ambassador worked with senior officials from Tatarstan’s Ministry of Industry and Trade and Investment Development Agency.